Woman of Wonders: With nearly 60 costumes and 50 conventions under her power belt, 2010 Auburn graduate Katie George is a cosplay playa. Wonder Woman is an Auburn fan. So is Joan from Mad Men. And Dr. Girlfriend from the Venture Brothers… which is all old news to any orange and blue clad photo-oppers who’ve happened to attend the Chick-Fil-A Kick Off Classic in the last few years. Each Labor Day weekend, the game shares downtown Atlanta with Dragon*Con, the world’s largest sci-fi / fantasy convention, and one of the biggest events on cosplay extraordinaire Katie George‘s calendar. The most football-ish fun actually came when Bama met Clemson to start the 2008 season. Katie George as Joan Holloway from AMC’s “Mad Men” in 2010. George graduated from Auburn in 2010 with a BFA in Theatre Design/Technology, with an emphasis in Costume and Make-up Design. Cosplay, short for “costume play,” is a blossoming subculture that promises perpetual Halloween to all its decked out denizens. If there’s a cartoon character you’re into, then dress up like the cartoon character. A movie character? A comic book character? Make or buy a costume—George makes all of hers herself—and then get together with other cosplayers and take a road trip to Dragon*Con or Comic-Con or Conny-Con Con or wherever there are people in costumes to take pictures of and to take pictures of you. George estimates there to be at least 280,000 cosplayers in the world, if not millions, and despite her tendency to downplay her own costumery accomplishments, she has slowly made a name for herself—her occasional nom de con (and the name of her cosplay website) is Pink Ninja—in the growing cosplay scene in the seven years since she’s been attending conventions. She’s won lookalike awards. She’s sat on numerous convention panels. Despite dreams of breaking into Atlanta’s burgeoning film industry as a costume or make-up designer after graduating from Auburn, George opted for a “real” job and currently works as a production coordinator at an Atlanta marketing firm. You might say her cosplay activities are a away to keep hope alive. 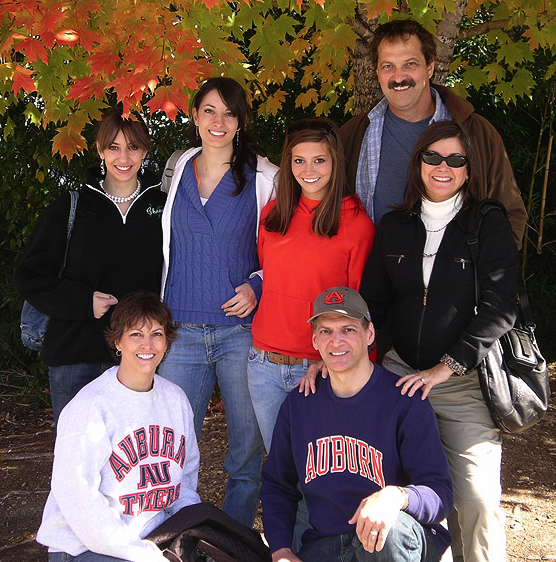 George is the product of a mixed marriage—”my mom is an Auburn alum, and my dad spent a semester at Alabama… which, as you know, is more than most Bama fans”—but you can’t tell from this photo … (apparently because those dudes are her uncles). So has the cosplaying Auburn fan ever thought of crossing the streams? h/t Teckla, photos via PinkNinja.org. For more Auburn-Con-ishness, check out FitForDragonCon.com, maintained by an Auburn man (the same Auburn man ) who dotcommed his dreams to get in shape for Dragon*Con 2012. I need to meet this girl. Katie, I’ll be at the Homecoming game. Call me. Great article, and thanks for the wordemup at the end!